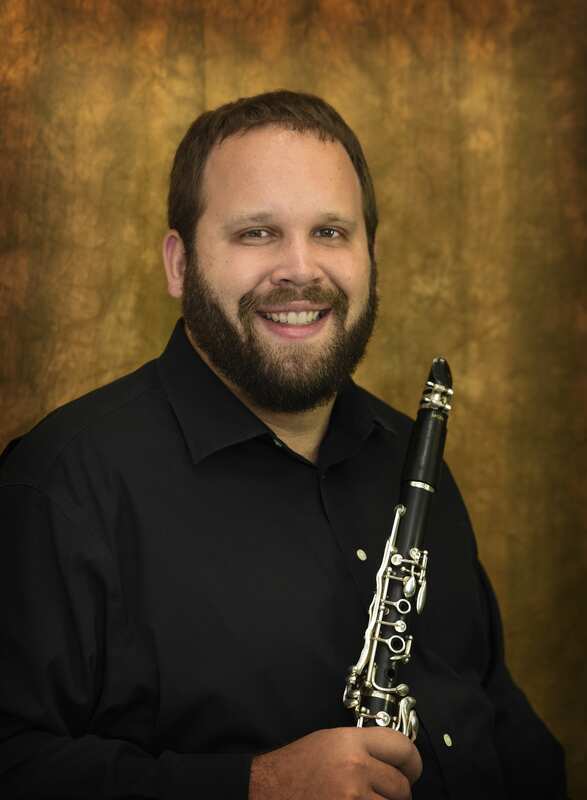 Andrew Sprung is Adjunct Instructor of Clarinet at Spring Arbor University and Hillsdale College and Second Clarinetist of the Traverse Symphony Orchestra (Traverse City, Michigan). An experienced orchestral musician, he has performed with the Toledo Symphony Orchestra, Fort Wayne Philharmonic, Grand Rapids Ballet, Lansing Symphony Orchestra, Windsor Symphony Orchestra (Windsor, Ontario, Canada), Battle Creek Symphony Orchestra, Michigan Philharmonic (Plymouth, Michigan), Dearborn Symphony Orchestra, Arbor Opera Theater (Ann Arbor, Michigan), Lima Symphony Orchestra (Lima, Ohio), Central Iowa Symphony (Ames, Iowa), and others. Sprung’s performances have been broadcast on WRCJ Detroit, WBLU Grand Rapids, WKAR East Lansing, and Interlochen Public Radio. He has performed with internationally renowned artists in the classical, jazz, and popular music genres, including Ralph Votapek, Zach De Pue, Bob James, and Josh Groban. Sprung also maintains an active schedule as a chamber musician. He is Ensemble Coordinator and founding member of the Hillsdale College Faculty Woodwind Quintet and has performed as guest artist at the Interlochen Center for the Arts, University of Hawaii at Manoa, Iowa State University, Saginaw Valley State University, and with the Ames (Iowa) Chamber Artists. As a soloist, Sprung has performed concertos with the Livingston Symphony Orchestra (Brighton, Michigan), Spring Arbor University Concert Band, Bowling Green State University Wind Symphony, Iowa State University Symphony Orchestra (as winner of its concerto competition), and the municipal bands of Ames and Mason City, Iowa. His performing career has taken him to Carnegie Hall, Chicago’s Orchestra Hall, and venues in Canada and Europe. A proponent of new music, Sprung has participated in numerous commission projects and premiere performances of renowned composers, including Luciano Berio’s Chemins VII (North American premiere), David Gillingham’s Double Image (world premiere), and as soloist for David Maslanka’s Concerto for Clarinet and Wind Ensemble (Michigan premiere). He was a guest artist at the 2017 Southeastern Composers League Forum in Lexington, Virginia and has performed at the New Music Festivals of Bowling Green State University and Heidelberg College. Sprung maintains a busy schedule as an educator. In addition to his university positions, Sprung teaches private lessons, sectionals, and master classes to high school and middle school students throughout Michigan. His students consistently earn Division I ratings at Solo & Ensemble festivals, invitations to Michigan All-State Band & Orchestra and Michigan Youth Arts Festival ensembles, and admission to college and university music programs. He currently serves as Artist in Residence for the Novi High School Bands, where he teaches sectionals, coaches chamber ensembles, and rehearses and conducts the clarinet choir. He was formerly Instrumental Music Instructor at Anthony Wayne Local Schools (Whitehouse, Ohio) and Instructor of Single Reed Methods at Bowling Green State University. An active scholar, Sprung has been published in The Clarinet, the official journal of the International Clarinet Association, and in De Klarinet, a Dutch language publication based in The Netherlands. His transcriptions for bass clarinet and piano are currently available for purchase through Alea Publishing of Tacoma, Washington. Sprung holds memberships in professional organizations and honor societies including the International Clarinet Association, Pi Kappa Lambda National Music Honor Society, The Honor Society of Phi Kappa Phi, and The Phi Beta Kappa Society. Sprung holds a Doctor of Musical Arts degree in Clarinet Performance from Michigan State University, a Master of Music degree in Clarinet Performance from Bowling Green State University, and a Bachelor of Arts degree in Music from Iowa State University. His primary clarinet teachers include Caroline Hartig, Kevin Schempf, Joseph Messenger, and Harvey Von Wald. Sprung is a Selmer Paris Artist, performing on Selmer Signature clarinets and a Selmer Privilege bass clarinet.